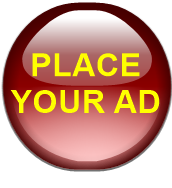 • Once an ad is submitted, it cannot be cancelled or changed. All sales are final. No refunds or credits. 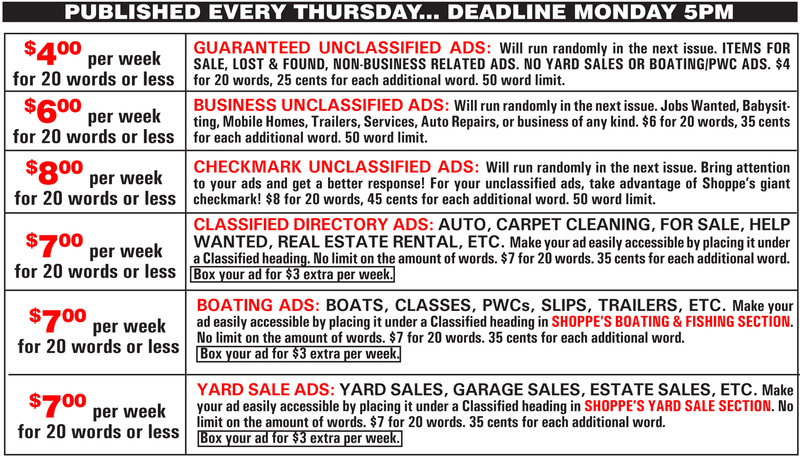 • No more than 3 unclassified ads of any kind per phone number per week. • WE DO NOT TAKE PERSONAL ADS OR ADS SOLICITING TO A P.O. BOX. • Ads may appear only once per issue. • SECURITY POLICY “Your payment and personal information is always safe. Our Secure SocketsLayer (SSL) software is the industry standard and among the best software available today for secure commerce transactions. It encrypts all of your personal information, including credit card number, name, and address, so that it cannot be read over the internet. Please read ad descriptions below to see what type of ad you should place. By clicking on the above button, I hereby assign to SHOPPE any copyright to all advertisement placed.